We learn it at high school: Release two objects of different masses in the absence of friction forces and they fall down at the same rate in Earth's gravity. What we haven't learned, because it hasn't been directly measured in experiments, is whether antimatter falls down at the same rate as ordinary matter or if it might behave differently. Two new experiments at CERN, ALPHA-g and GBAR, have now started their journey towards answering this question. ALPHA-g is very similar to the ALPHA experiment, which makes neutral antihydrogen atoms by taking antiprotons from the Antiproton Decelerator (AD) and binding them with positrons from a sodium-22 source. ALPHA then confines the resulting neutral antihydrogen atoms in a magnetic trap and shines laser light or microwaves onto them to measure their internal structure. The ALPHA-g experiment has the same type of antiatom making and trapping apparatus except that it is oriented vertically. With this vertical set-up, researchers can measure precisely the vertical positions at which the antihydrogen atoms annihilate with normal matter once they switch off the trap's magnetic field and the atoms are under the sole influence of gravity. The values of these positions will allow them to measure the effect of gravity on the antiatoms. 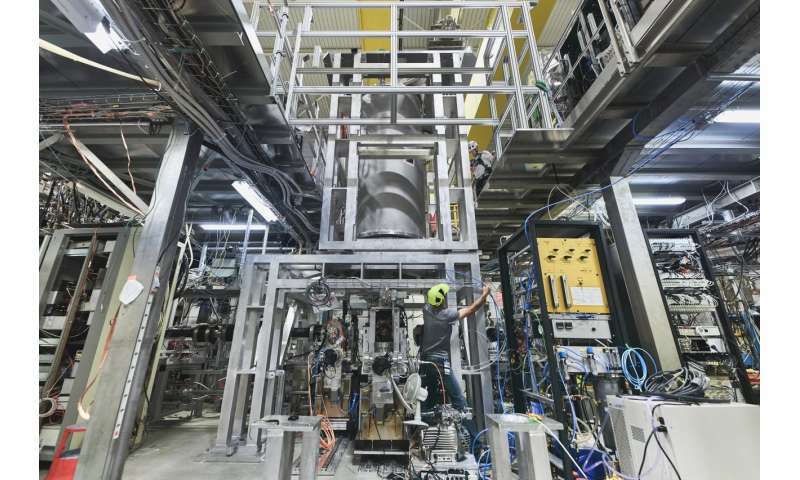 After months of round-the-clock work by researchers and engineers to put together the experiments, ALPHA-g and GBAR have received the first beams of antiprotons, marking the beginning of both experiments. ALPHA-g began taking beam on 30 October, after receiving the necessary safety approvals. ELENA sent its first beam to GBAR on 20 July, and since then the decelerator and GBAR researchers have been trying to perfect the delivery of the beam. The ALPHA-g and GBAR teams are now racing to commission their experiments before CERN's accelerators shut down in a few weeks for a two-year period of maintenance work. Jeffrey Hangst, spokesperson of the ALPHA experiments, says: "We are hoping that we'll get the chance to make the first gravity measurements with antimatter, but it's a race against time." Patrice Pérez, spokesperson of GBAR, says: "The GBAR experiment is using an entirely new apparatus and an antiproton beam still in its commissioning phase. We hope to produce antihydrogen this year and are working towards being ready to measure the gravitational effects on antimatter when the antiprotons are back in 2021." It may be a shocker to find that a single atom is never affected by gravity. Actually they are. That's how they got the numbers to compare these experiments with. I am sorry, I think my original comment was off. I tried to delete it, but the system didn't allow. I think it is more likely that the antimatter hydrogen will react to planet's gravity the same way the normal hydrogen does. My original comment should have been the question whether a single hydrogen atom is creating a gravitational field, since I don't see a logical way how it would create space-time curvature. But it is not really related to the experiments described above. I don't see a logical way how it would create space-time curvature. It has energy. It has mass. Why wouldn't it create spacetime curvature? Or how do you thin something like a planet (which is nothing but a bunch of atoms together) creates curvature? I think it is more likely that the antimatter hydrogen will react to planet's gravity the same way the normal hydrogen does. Current theory would say it is so. However, there appears to be less antimatter out there than matter, so something has to be different in some subtle way. This is one of the properties that can be checked for a difference. Give @NICK a break, @antialias. @NICK, understood by at least one here. That antihydrogen should fall at the same speed is my expectation too, but don't count on it. It's not clear we haven't fulfilled the Sakharov criteria. can you say caesium fountain?